a pleasing aroma to the Lord. 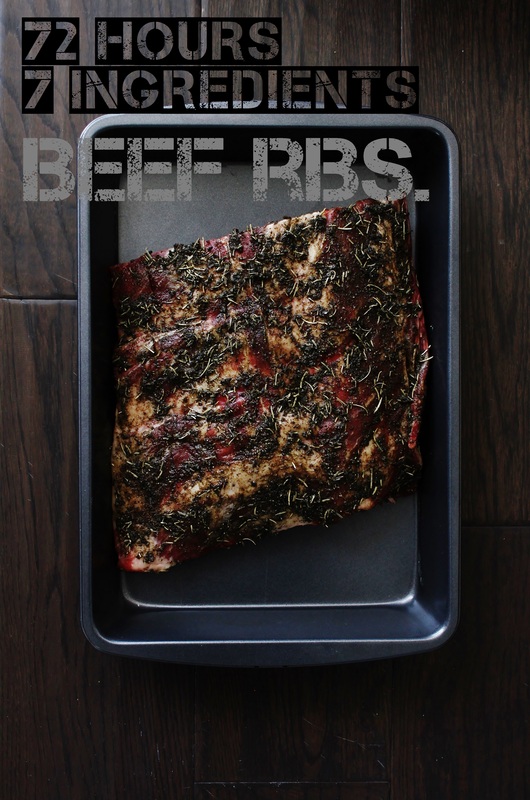 To make the 72-hour beef ribs, stir together the thyme, rosemary, pepper, garlic puree, salt, and olive oil until a thick paste forms. Rub this mixture all over the beef ribs (on all sides, emphasizing the top-side). Place the ribs in a roasting tin and cover tightly with foil. Refrigerate for 3 nights (2 days). On the third day, 3~4 hours before mealtime, preheat the oven to 315 degrees F, with the rack placed in the middle of the oven. Take the roasting tin with the ribs straight from the fridge into the oven, you don’t even have to wait for the oven to reach its temperature. Bake for 3~ 3 1/2 hours until the meat literally falls off the bone and your house smells better than any steakhouse you know. Serve immediately. I highly recommend serving this with mashed potatoes and a generous drizzle of the beef drippings. I’m sorry I don’t have photos of the finished product, but that just goes to testify for its deliciousness.